(Newser) – Andrew Gaskell set out to find himself and, well, got lost. The Australian was rescued from the Malaysian jungle on Tuesday after spending two weeks alone in a remote section of Borneo's Mulu National Park. Gaskell had been touring Asia while trying to "come to some sort of conclusion as to who I am and what I want to do with my life" when he entered the park on Oct. 18, planning to do a week-long hike, reports the Telegraph, which cites Gaskell's travel blog. 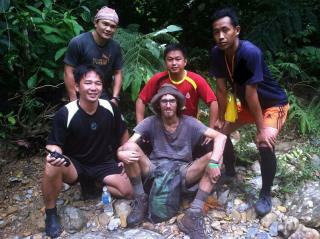 He reached the summit of Mount Mulu but became lost on the way back down. Gaskell—who says he ate wild ferns and drank creek water, per the Borneo Post—was found by rescuers about 65 feet from a trail on Tuesday with leeches covering his legs and maggots rooted in one. Since he came right out and admitted that he was knowingly trespassing, I hope he get fined for the cost of his rescue. Especially since this is not the first time he has pulled such a stupid and inconsiderate stunt.